Please Note: Whilst we have taken great care in making our GNV Azzurra guide as accurate as possible, onboard facilities, services and entertainment may vary depending on the date and time of year that you travel, facilities mentioned may change without notification and ferry companies reserve the right to operate vessels other than those mentioned at time of booking without prior notification. It was a bit difficult finding Check-In and it would be a good idea to get a complete GPS address on the ticket or on your website. The staff from beginning to end of the trip were friendly and service-minded. Our 2 berth outside cabin was nice, with ensuite bathroom, the beds were made and there were clean towels. Due to the time of year (last October) the ferry was not very full, and this reflected on the lack of catering. However, we were very satisfied and and had a pleasant sailing between Palermo and Naples. The journey was as we expected. Comfortable cabin, and good services on board. We want to repet this experience especially because is a comfortable way to travel from one city to another at night so you can rest and enjoy the day once you arrive to your destination. Excellent riceiving, restaurant service, cleaning, kindness of the staff and respect for the schedule time. Negative aspects, caos at night total anarchy no one respect the established seats, owner of dogs don't respect the rules, dogs with no muzzle walking on the deck, and instead of keep them in the kennels they were sleeping in the common area with us. Staff shoul be more vigilant, same for the landing where you only find caos and confusion, 100 of people left in the stairs and corridors. As resident I often travel with GNV. This year I appreciated the initiative to offer the cabin at a affordable price. It is an excellent way to facilitating the customers using the ship potential, good. Apart from the expensive prices at the restaurant.... The return journey was an hell, too hot, the air conditione was not working. The staff did not help. The boarding was in advance and it was a good thing because it was so hot! Same quality and kindness with GNV. Expensive prices, for tickets and food, but it is known. Excellent the staff on board, medium level of cleaning, really slow ship. Departure from Genova to Porto Torres at 20.30, easy boarding and good cabin. Great! Air conditiong too strong. Unfortunately the staff working at the restaurant wasn't nice at all. After our last crossing in 2013, we decided to travel with the same company from Sicily to Genoa in June. The restaurant was closed during the sailing, the swimming pool on board was empty and quite dirty, just like everywhere on board. 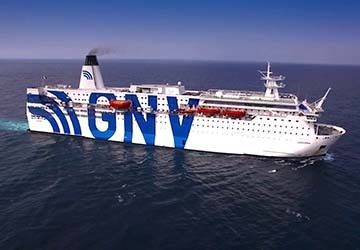 We were quite sceptical about making another booking for July from Genoa to Sardinia and Grandi Navi Veloci offered the cheapest crossings. To our great surprise, the ship Toscana (a former ferry from Scandinavia and quite old) proved to be nice with several excellent restaurants, entertainment and bars on board. All this at very reasonable prices. Good service from motivated staff. The 4 berth cabin was quite small and the air conditioning went off at night but this did not spoil the fun. Disembarkation was somewhat later than planned but this wasn’t a problem because we were well-rested. De return trip with Tirrenia on the other hand was just the opposite. I sailed with M/S Snav Toscana between Sardinia and Italy. The ship was nice and of good standards. Good food in the restaurant. Very friendly staff on board. The cabin was clean. I would love to travel again with the M/S Snav Toscana again. Apart from a poor and disorganised embarkation procedure, it was like a mini cruise in both directions and highly recommended. Our experience on the ship was very pleasant until we departed which is outside of the control of the ship or company as there was VERY rough seas that night. Neither my husband or I slept at all as we were really rolling around in large swells & it made it nearly impossible to fall asleep. Outside of that, we had a fairly pleasant experience. We boarded & went straight to our cabin which was in pretty good shape with the exception of a bad smell. Almost like lingering cigarette smoke - assuming the room used to be a smoking room. We decided to grab a bit to eat at the sit-down restaurant & we were pleasantly surprised to see that the restaurant was well maintained & kept. We had a lovely server who was quite attentive & were incredibly happy with our meals! My husband had a pizza that was delicious (and large!) and I had an amazing fish baked with mussels & clams in foil. Was a wonderful surprise as we did not expect to have such great food on a ship. We purchased wine after our meal & sat in a common area & enjoyed the bottle. We were disappointed to learn that the wi-fi on the ship was not working which would have been a major plus during our travels but regardless we enjoyed the evening chatting. "A crossing between Genoa and Porto Torres"